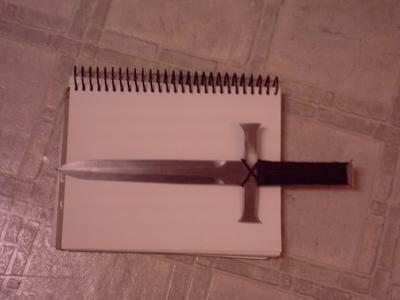 QUESTION: I bought this dagger somewhere in the vicinity of 2000-2001 when I was still in high school, more or less on a whim (I am not a collector in any capacity - I'm too damn poor for that sort of hobby) at a Renaissance Faire in Georgia. I think it was called something like "Templar Dagger" though I don't believe it's a historically accurate representation of anything, much less something the Knights Templar might have actually carried. The blade is in the neighborhood of a foot long and it's heavier when you pick it up than you'd think just looking at it (well, to me anyway but what the hell do I know). If somebody could give me some kind of info about this blade I'd appreciate it. I can't give a definitive answer on this one, though it looks a lot like the kind of blades made by Starfireswords or Badgerblades - in other words the big, slightly 'clunky' and overbuilt beaters these guys specialize in (and they DO attend quite a few Ren Faires all over the place, so it may even be one of theirs). Definitely looks sturdy and I'd imagine that it would pack quite a punch. It may be hard to pin it down to a specific maker, as there is a reasonable chance it was made by a skilled hobbyist using the stock removal method. Sorry I couldn't be of more help on this one. Yea, it's pretty hefty - it's made out of a single piece of steel, probably punched-out with a die or something and then shaped. The hilt is made from a couple pieces of something rigid (PVC or some other kind of plastic, I guess) attached with something like epoxy on either side of the steel and wrapped with a black cord, probably nylon. I was told when I bought it that it was hand-forged and has some slight non uniformity that would suggest it's probably is. The edge isn't sharpened but it has a sharp point.